When a pulley or balance wheel is to be balanced you must first have a shaft that is of the same size as the hole in the pulley. Of course, the wheel or pulley must be turned and trued up so that it is finished before you balance the same. 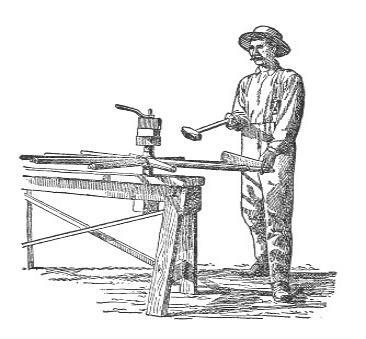 After the shaft has been put in and tightened, place two pieces of angle iron or T-iron about two feet long parallel on a pair of wooden horses. The irons must be level. Now place the pulley between the irons so that the shaft will have a chance to roll on the "T" or angle iron, and you will notice that the heaviest side of the pulley will be down. Start it rolling, and the pulley will always stop with the heaviest side down. Now, if the pulley or wheel, as the case may be, has a thick rim, then bore out from the heaviest side enough to balance, or you can drill a hole in the lightest side and bolt a piece of iron to it just heavy enough to balance the wheel. Every wagon-maker is supposed to know how to put in spokes. Still, there are sometimes wagon- makers, especially beginners, that don't know. First clean out the sliver left of the old spoke, and make the mortise dry, and in every case use glue. In a buggy wheel take the rivet or rivets out, if there is any, and be sure to have the right shape of the tenon to fit the mortise in the hub, so as to make the spoke stand plumb. Set the tenon going through the rim. Be sure to have this tenon reach through. This is important in filling a wagon wheel, because, if the tenons don't reach through the fellow, then the heft will rest against the shoulder of the tenon, and when the tire is put on tight and the wagon used in wet roads, the fellow will soften and the spokes settle into the rim. The tire gets loose, and some one, either the wagon-maker or the blacksmith, will be blamed-in most cases the blacksmith. Of course, the tenon should not be above the rim. After the spokes have been put in rivet the flange of the hub, or so many rivets as you have taken out. This should always be done before the tire is set.